Wander through the glammy gates into a world of pure imagination. 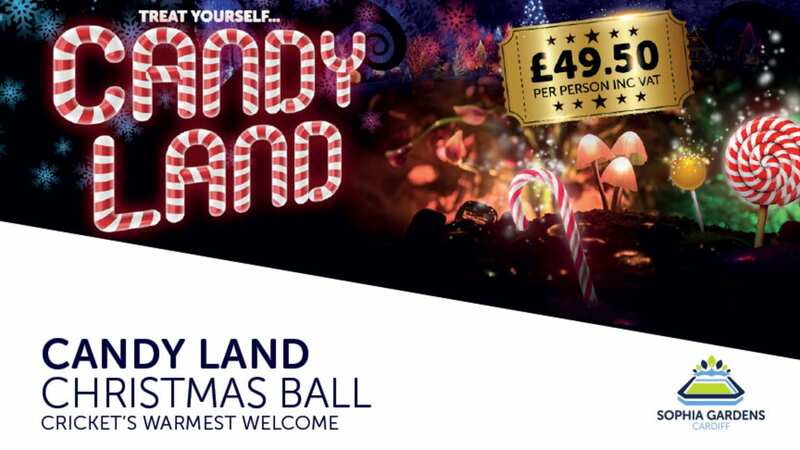 Treat yourself to the sweetest party around and get ready for The Candyland Christmas Party at Sophia Gardens this Christmas. Our most fantastical and vibrant theme, the party will feature giant candy canes, lollipops and the famous glammy gates, so why not get your golden tickets and enjoy fine wine, great company and fabulous entertainment. Christmas parties at Sophia Gardens Cardiff, home of Glamorgan Cricket, are famous for being the best in town, and we know you’ll have a fabulous night. Just remember it is sure to be a ‘Glamorous’ affair at The Candyland Christmas Party. Private and mixed parties are available. Minimum booking 8 people at mixed party nights. Doors open at 7pm, dinner served at 8pm, bar close at 12.30 and venue closes at 1am. Call 02920 419 359 or email sales@glamorgancricket.co.uk for further information or to book.